UnbreakableIT had the pleasure this year of being a gold sponsor at the Florida Business Expo. 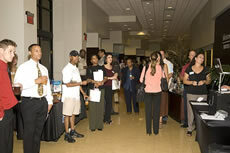 The Florida Business Expo drew businesses of all sizes with something for everyone. It was a fantastic show that proved again that small businesses drive economic growth. Luis Cuneo, a senior marketing executive with IBM, delivered a keynote to businesses on how to thrive and grow in the current economic climate. This message was echoed in the UnbreakableIT presentation on using IT to rout the competition. For a business in these economic times, where the DOW dropped 400 points today alone, being able to get the most from you business investments is not just the key to success, it is essential to survival. UnbreakableIT met many business owners and executives that are facing tough choices about where to spend their limited capital. A business can’t just rack up limitless debt like the government and hope to somehow find a way to pay it off. Cost cutting measures for a business mean the difference between just surviving and thriving. The Florida Business Expo drew record visits and speaking attendance for UnbreakableIT because the value of using an IT company to be more competitive is something that owners can believe in. Turning IT from a cost center into a revenue center with smart solutions is real change that businesses can believe in. To find out how your small business can leverage technology and business intelligence to be better than your competitors, give us a call at 407-583-6291. The Phoenix Network would like to thank all of the 2011 Florida Business Expo's exhibitors, sponsors, and attendees. A special thank you also goes out to President Liz Otts who helped us launch our successful promotional campaign, which included interviews with multiple members of the Florida Business Expo Advisory Board. Not only were we able to host several highly influential business executives from the Central Florida area on The Guetzloe Report, but we were also able to get several others voices out on the air by being afforded the opportunity to broadcast live from the event. If you didn't get the chance to make it out to this year's Florida Business Expo, be sure not to miss it next year! On behalf of the Rosen Center Hotel and my team, I would like to convey my sincere gratitude to you and most importantly a big “Congratulations” on a job well done!! Liz, I know this venture was a dream of yours and to see it finally arrive must be particularly rewarding for you! I was especially impressed with the professionalism of the vendors, quality of the business sessions and overall flow of the entire event. Even though we encountered some minor “hick ups” you and your staff handled them with ease…. We certainly look forward to hosting your event again in the future. What an awesome event! Got to meet so many people who are interested in Ice sculptures for the holiday season! Your events are always Great!!! I just wanted to say thank you so much for all of your incredible support. You did such a fantastic job in putting everything together and executing a quality expo! Everyone I spoke with sounded very positive about the experience. CRN received great exposure and we raised some much needed funds! I haven’t totaled it up yet, but we should be around $700 on the silent auction and raffle and since God watched out for us we should easily be able to raise at least $1500 more. Yeah!!! I hope you’re taking the day off… Thanks again, doesn’t really relay the sentiment. Let’s just say, you are appreciated. Enjoy the rest of your week! The one thing I'll say is you outdid yourself. SUPERB,EXCELLENT AND CLASSY! Thank you for today’s Florida Business Expo, I enjoyed meeting both the exhibitors as well as the guest of the show. We look forward to building new working relationships with everyone involved with the show. I can’t imagine the work it takes to put on a show like this, congratulations for a job well done. I got to stop by for about an hour, had a great time, no issues with parking and everyone was really nice! I just wanted to send you a quick note to Thank You for putting the Mercedes Expo together last week. We had an excellent time meeting all the attendees as well as the exhibitors. I also wanted to let you know that I have been an exhibitor and an attendee at many expo's throughout my career as a Golf Professional and this one was by far the best one I have ever been a part of. You did an excellent job of putting it together and attracting the best patrons. I have never benefited so much from a function such as this. Thank you and I look forward to being a part of the next one.